Dengue fever, the "world's fastest growing vector-borne disease," threatens some 2.5 billion people throughout the world, killing 20,000 each year. And climate change, according to a new report from U.N. University’s Institute for Water, Environment and Health, is going to put billions more at risk. So as climate change boosts baseline temperatures, it's expected that risk will increase as well. This will be particularly prominent in northern regions where, for now, winter temperatures are too cool for mosquitoes to survive: the limit for Aedes eggs is -2 degrees Celsius (28.4 degrees Fahrenheit). Looking at what might happen if global temperatures were to increase by 2 or 4 degrees Celsius, the researchers predicted that a number of key areas that are currently too cold to sustain year-round mosquito populations, including the mountainous regions of South America and large areas of Europe, face a "serious threat" in the future. 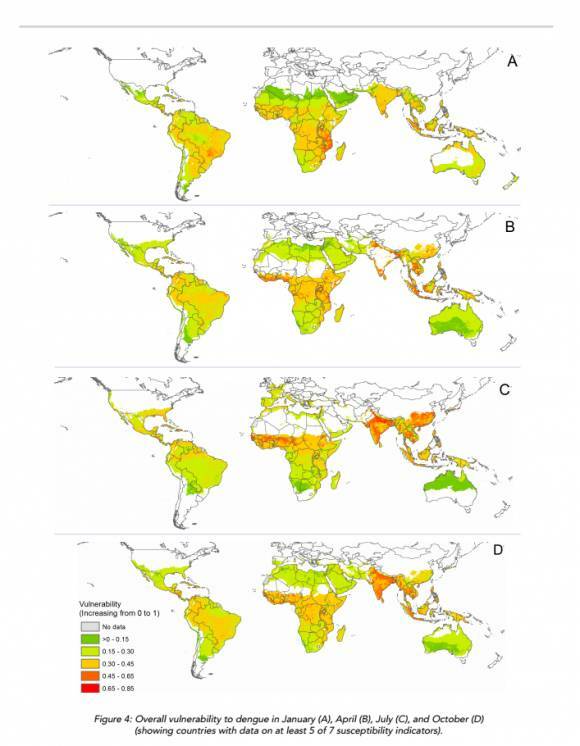 By 2085, they found, the increase in exposure due to climate change could double to 3.5 billion -- factoring in population growth and other conditions that favor dengue, like urbanization and land use intensification, a total of 5 to 6 billion people could be at risk. Vulnerability doesn't translate directly to disease rates, of course. South and Southeast Asia is shown as having the highest degree of risk, for example, but Brazil, by far, had the highest number of actual dengue cases between 2004 and 2010. That's because, while there's no vaccine for dengue (yet), a number of other factors, such as access to healthcare and clean water, along with government mosquito policies, can help mitigate risk. As the world gets hotter, improvements in those areas are going to become all the more important.